>>> Free Birth Chart Wizard! 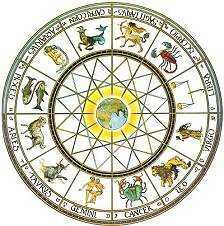 The outer rim of the horoscope wheel represents the zodiac ("circle of animals"), the belt containing the twelve astrological signs. Twelve equal sectors of the zodiac, once approximately coinciding with named constellations, are especially significant in astrology. These mark the astrological signs. The starry constellations are symbolic patterns in the heavens, but the signs are geometric structures based on, but not identical to the constellations of the same names. The signs and constellations no longer coincide in Western Tropical Astrology, thanks to the precession of the equinoxes. The planets and the luminaries (Sun and Moon) move in their courses through the signs, along the plane of the ecliptic. It is their relationships in spirit that make astrology possible. When we ask: "What is your Sign? ", we are really asking where the Sun is placed in your birthchart. This is easy for most people to answer, because the Sun travels throughout the entire zodiac over the course of a year, making its course through the heavens entirely regular and predictable. And since you have found this page, you probably have your own personal birth chart (horoscope) already calculated, but if you do not, please click here to calculate your own chart. It's free! There are twelve signs, more or less matching the twelve months, though since our calendar was recalculated under Pope Gregory in the 16th Century, the months no longer match the signs exactly. The signs are divided into 30 equal degrees each. The circle of the zodiac is therefore divided into 360 degrees, each in itself significant – although the specific influence of degrees is beyond the scope of our brief analysis. Each sign projects a set of deep-seated behavioural characteristics and typical responses to the influence of circumstances. Each sign also symbolises one of the stations on our spiritual journey. As we undergo spiritual growth, exploring the process of karmic fruition, each of the signs presents us with characteristic challenges and rewards. The nature of these in terms of a sign's character is revealed through the combination of its Element (Fire, Air, Earth, or Water) and its Quality (Cardinal, Fixed, or Mutable). The energies of the signs do have some meaning in themselves, but are most strongly expressed as a backdrop for the planets and their relationships, as well as their placement with relation to the house cusps, especially the angles (1st, 10th, 7th and 4th houses, in order of strength). Particular planets can be either sympathetic or otherwise to specific signs (see Ptolemy's Table of Dignities). The path of the planets through the signs reveals the map of destiny. The positions of the planets and their relationships within the signs of the zodiac determine our character; knowledge of the symbolism is the key.